Droughts occur in arid and semi-arid areas of the world, but also in humid areas, and can develop over short periods (flash drought) or longer periods (seasons/decades). Even though progress has been made, it remains difficult to adequately characterize, monitor, forecast and manage droughts, due to their multi-faceted nature. Usually, drought does not directly cause fatalities, but a wide range of socio-economic and environmental effects may occur, and, depending on the region, water-and food-related diseases and casualties can be triggered. Europe has regularly been hit hard by drought (e.g. recently Russia), and large portions of USA, Mexico, Brazil, China, India, Central Asia, South Africa, the Great Horn of Africa, or Australia, have been affected by drought. So globally, drought affects more regions, and more people, than other natural hazards. Additionally, climate change projections for many areas indicate that droughts are likely to become more frequent and more severe due to the increased variability of precipitation and temperature, tied in some cases to decreased average precipitation and increased average temperature. Hence, there is an urgent need to improve drought preparedness through measures that reduce vulnerability to drought and the risks they pose, in particular considering the uncertain future. Drought. Research and Science Policy Interfacing includes contributions to the International Conference on DROUGHT: Research and Science-Policy Interfacing (Valencia, Spain, 10-13 March 2015), the final event of the EU FP7 research project DROUGHT-R&SPI (Fostering European Drought Research and Science-Policy Interfacing). 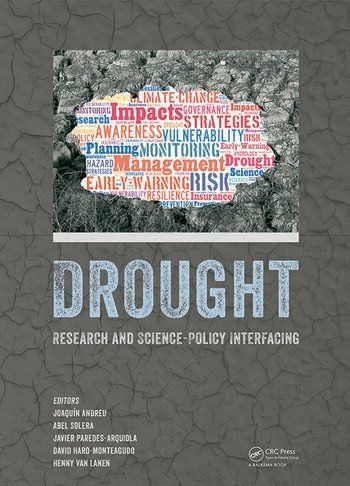 The book aims to foster development of drought policies and plans to reduce risk and vulnerability, and to enhance preparedness and resilience. The book addresses the following topics : (1) past, present and future of droughts (natural hazards, identification and characterization, impacts); (2) indicators, monitoring and forecasting (including early warning systems), risk and vulnerability assessment and reduction at different scales, and (3) preparedness and mitigation options (risk and vulnerability perception, water management and governance under drought conditions, design and implementation of drought policies and plans from the local to the regional, national and international levels, research Interfaces with drought policies). Drought. Research and Science Policy Interfacing will be of interest to researchers and professionals in those fields related to drought, such as climatology, meteorology, hydrology, agronomy, ecology, water economy, and water management, as well as to policy makers involved in drought preparedness and mitigation strategies at local, regional, national and international levels. Evaluation of drought occurrence in springs yields of the Nízke Tatry Mts. Drought and water scarcity in Iran: How to cope with and prepare for it?